Helios Exchange will assist along the entire project development cycle, from discovery to measurement & verification.You can start identify energy improvement measures with very little data, and if your building has already been benchmarked in Energy Star Portfolio Manager, we can import the data in just a few clicks. You can also submit a project at any give stage and we will help you bring the project to the finish line. insurance of the savings,which is required for HELiOS ESA and HELiOS E-Lease, and optional for other types of financing. estimated data based on building size, type and location (using data from the Helios inference engine). Based on this data, Helios will use its HELiOS Retrofit Explorer and other analytics to suggest potential energy efficiency measures and create a retrofit project. 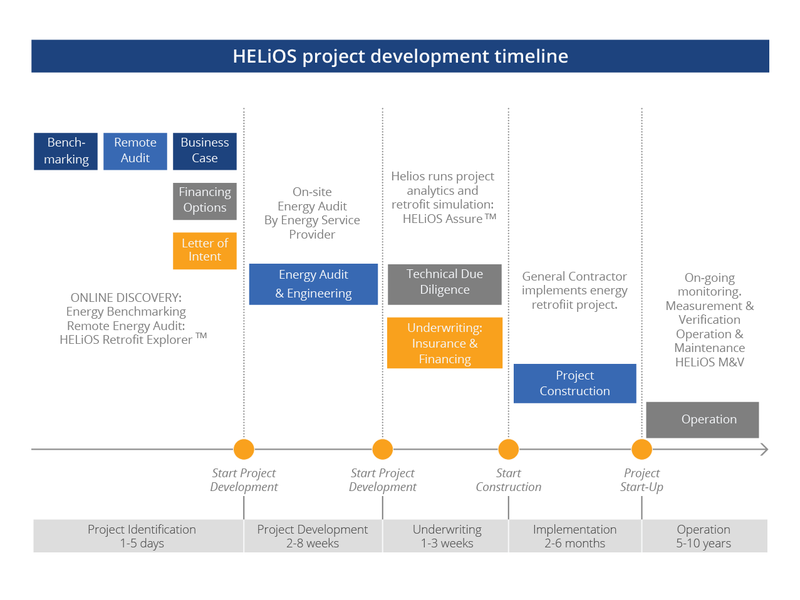 With this initial retrofit assessment, Helios will provide a preliminary business case, and will compare the financing options available for this type of project. Once an initial project has been determined, the owner must obtain an energy audit from a professional engineering firm. Helios can aid in this process by recommending a service provider as well as by refining the data already in its platform through its remote audit capabilities, which can lower the cost and decrease the time needed for the audit. Helios may also be able to provide funding for part or all of the energy audit, upon qualification for HELiOS ESA financing and the execution of project development agreement. When the audit is complete, the project financing can be finalized and the project implementation can commence.